Use the pH level chart below (after reading the instructions) to compare with the pH test paper in your pH test kit. This will identify your reading and help you to understand more about pH, and pH scales. It is best to do the test at least two hours after taking any food or beverage other than water. Drawing fresh saliva into the mouth and swallowing it several times before taking the test will make it more accurate. Place the colored end of the test strip inside your mouth or in contact with a saliva sample. You can place the colored end down on your tongue and press the test strip to the roof of your mouth with your tongue. All you need is good contact for a few seconds. 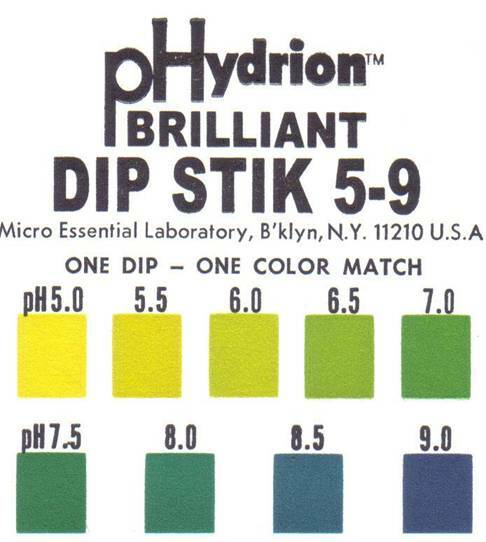 Match your test strip with the pH level charts below to determine the pH of your sample. An optimal reading is 7.0 - 7.5. Note that, due to slight differences in monitor settings, the color may not exactly match the original. The chart in the original kit would be the most accurate. As results can vary over a day, it is best to repeat the tests at different times of the day. The term pH is the accepted chemical symbol meaning potential of hydrogen. Hydrogen is the first element on the periodic table and it has the symbol of H. Water (H20) dissociates into the ions H+ and OH-. Blood pH needs to be between 7.35 and 7.45 - a pretty narrow range - for you to be not simply healthy, but alive! Here are some examples of the pH of various solutions. A reading of greater than 7.0 is alkaline, a reading of less than 7.0 is acid. The scale is logarithmic, so that a pH of 5 is 10 times more acidic than a pH of 6. Do you have a question or comment about your pH test results or pH in general? Want to share with everyone your results and what you plan to do to improve them? Do that here and see what others have said. Let's share our collective wisdom. For more information about how pH relates to your health, follow the link immediately below.